It’s time for the young talent to get their chance. That’s what Nationals Manager Davey Johnson has said and continues to say about the upcoming crop of homegrown pitching. It’s September. Therefore, based on previous trends of calling up the younger guys to play ball in the big leagues, Johnson is correct. 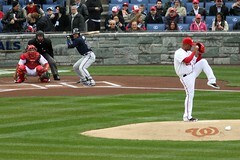 With that said, right-handed starter Livan Hernandez made his final start of the 2011 season Sunday. Washington lost 6-3 versus the New York Mets. Hernandez was informed by Johnson on Friday that we would not start again in 2011. The team would like to get a look at Stephen Strasburg and other pitching prospects during the final three weeks And, although the outcome was not desirable, Hernandez approached his final appearance as a professional. He tipped his cap to an ovation by the fans as he headed toward the mound from the bullpen to start the game. After a couple three up, three down innings, the Mets scored off Hernandez in the third when Ruben Tejada hit a two RBI-single with men on second and third. Washington answered back in the fourth when second baseman Danny Espinosa, first baseman Chris Marrero and catcher Wilson Ramos each raked in RBI’s to take reign of the lead of 3-2. Outfielder Jayson Werth led-off the inning with a walk followed by a single from outfielder Rick Ankiel to set up the RBI option for Espinosa who scored Werth with an RBI double. Marerro grounded out, sending Ankiel around to score. Ramos followed pace with an RBI double to give the Nats a temporary lead. That lead only lasted until the sixth inning when the Mets offense struck up with a four run rally, including a leadoff solo homerun by Lucas Duda off Hernandez, marking end of the day for Washington’s starter. Washington couldn’t manage any runs after that offensive output by the Mets in the sixth, though the bullpen did hold the Mets from scoring again.